A KKK rally…really? When I saw this on the news I was torn between laughing and crying. Laughing because members of the KKK thought that they would actually get away with this and crying because I could only hope the KKK would never actually get away with this. Take a breath, the good thing about all of this is that out of the 50 Ku Klux Klan members protesting in Charlottesville Virginia on July 8th, there were several hundred counter-protesters. Members of the North Carolina-based Loyal White Knights of the Ku Klux Klan, wore Klan robes, carried Confederate flags, and loaded firearms- allowable under Virginia’s open-carry law. They arrived to protest the city’s plan to remove a statue of Confederate Gen. Robert E. Lee from a park. Upon arrival, they were confronted by counter-protesters and a large group of law enforcement officers who escorted them away from the park. Counter-protesters shouted “racists go home”, “Black Lives Matter”, and even went to the extremes of blocking the Klan’s vehicles. At one point the use of pepper spray was used by the counter-protesters causing the police to use 3 canisters of tear gas of the crowd. The police called the riot of the counter-protests and unlawful gathering and then arrested 22 people. Klan member, Douglas Barker told CNN, “They’re trying to erase our history, and it’s not right what they’re doing.” His wife, Amanda Barker, told The New York Times, “People should be able to respect our heritage.” She added that she was underwhelmed by the number of people who had turned out to oppose the rally. Out of the 22 people arrested, most seemed to be anti-clan protesters, but the police has not released the affiliation of those arrested. 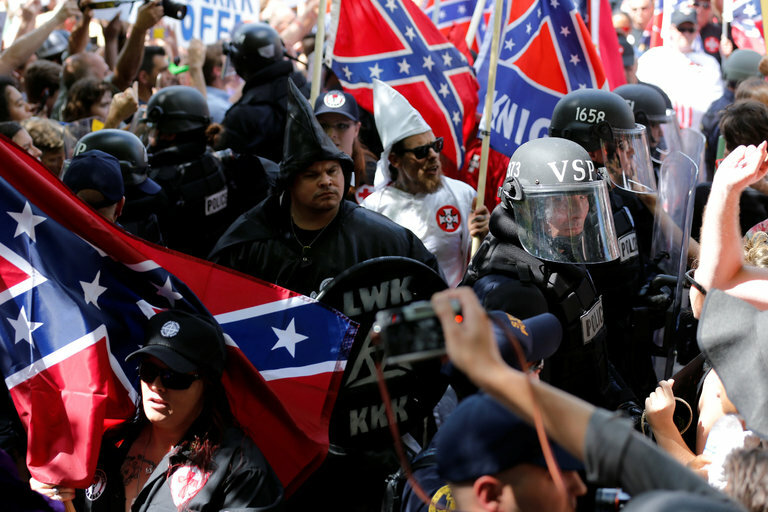 Counter-protesters said it was important to them that they attend the rally and chant against the Klan because without going against white supremacist viewpoints and standing up for what you believe in, nothing will change.